It's been six months since the official switch-over from magnetic strip credit cards to ones with embedded computer chips. The new EMV technology, used in many other parts of the world, is more secure. While you may have received replacement cards with the embedded chips, you may not be finding many retailers where you can use them. Personal finance website CardHub.com has conducted a study, finding that 42% of retailers have not upgraded terminals in any of their stores. The study authors call this “shocking,” since for the last six months, retailers have been liable for any fraudulent purchases made in their stores. Retailers, meanwhile, say it isn't their fault. A spokesman for the National Retail Federation (NRF) recently told Yahoo Finance that once chip readers have been installed, the installation must be certified by the credit card industry. That process, he says, is taking longer than anyone expected. The CardHub survey suggests consumers are either confused or ambivalent about the whole issue. 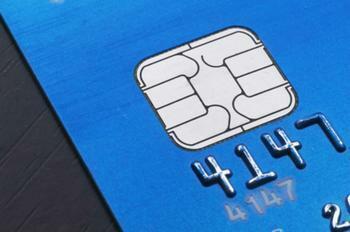 Among the consumers questioned, 41% don't have an embedded chip credit card. More than half of consumers – 56% – didn't care if a retailer's terminal was EMV compliant. Retailers have not been overly enthusiastic about the move to chip readers. For one thing, it means investing in new technology. For another, retailers have not been sold on the system's security. As we reported in early October, the NRF urged adoption of an EMV system that requires a PIN, arguing that a simple signature is easily forged, negating the cards' enhanced security features. According to the CardHub survey, about one-third of retailers in the survey have upgraded to chip readers at 90% to 100% of their stores. They include some of the nation's major retailers, such as Costco, CVS, and The Home Depot.